As our treasured legacy, Brazilian Voices Kids have blossomed into a very talented group, ranging from ages 5 to 15, comprised of Brazilian Voices singer’s children, as well as others from the community, who gather in parallel to the Brazilian Voices rehearsals to learn about Brazilian music, take lessons in singing Brazilian songs, practice the language, and prepare for special performances. From a very early stage, when Brazilian Voices started to take shape and meet for rehearsals, singers brought their children along, hoping to expose them to Brazilian music, culture, and language. As some of the kids would sing along with their mothers during those rehearsals, the idea of forming a children’s group evolved naturally. When, in 2003, TAM Airlines invited Brazilian Voices and kids to perform during their annual Christmas Party, BV’s mothers recruited all their children to rehearse for the event. As a result, in December 2003 the first Brazilian Voices kids performance took place at the Manuel Airtime TAM theater for an estimated audience of 500 people. Another wonderful opportunity for a performance occurred in 2004 when the CCBU (Cultural Center Brazil USA) invited the children to sing at the Miami Children’s Museum during the “Exploring Brazil” exhibition. Twenty children participated in this event, showing the interest to create a more formal group. 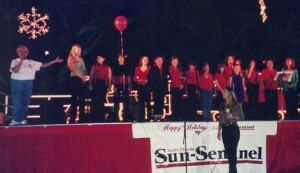 In 2005 scheduled rehearsals, which included singing classes coupled with Portuguese lessons became a reality, the Brazilian Voices Kids was born. Since then, many performances have occurred. September/2010 – Fundraising Feijoada at Boteco – Celebrating Brazilian Voices 9th anniversary. In 2006 the group participated with Jingle Bell Rocks in the Brazilian Voices’ CD and a concert at the Hollywood Playhouse Theatre. Between 2008 and 2009 the BV Kids was reactivated by Ana Appolonio who reorganized and reenergized the group. Every department in the Brazilian Voices organization depends on idealistic and motivated volunteers to succeed, and BV kids has relied on the support of these incredible women that have guided this amazing group as coordinators. From 2010 to 2013: Katia Germano and Renata Pizzutti. In 2011 Brazilian Voices Kids recorded its first CD. The group had the participation of 35 children ranging from 5 to 15 years, meeting for rehearsals every other Saturday in Weston, FL.